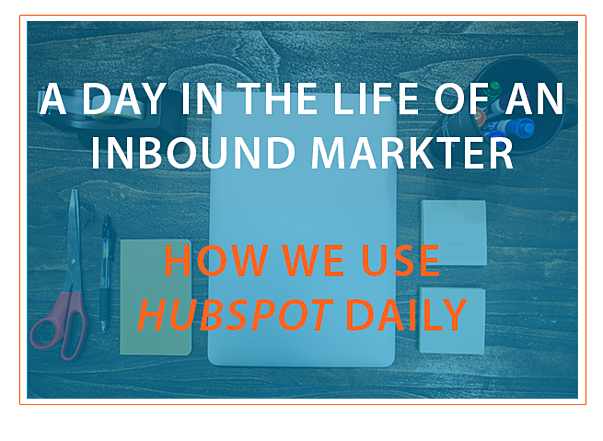 What does the day in the life of an inbound marketer in 2015 look like? Every inbound marketer will probably have a different answer to this question. My personal daily routine has morphed over time as I’ve stopped doing things that didn’t work and adopted new practices that did. Here at 98toGo, we put our inbound marketing pants on one leg at a time just like the rest of you (unless of course it’s a work from home day, then all bets are off!). But over the years we’ve found that when we tackle approach our work day in a particular order, we tend to get more accomplished. Every day is not exactly the same of course, however we've made it a habit to try and hit most of the items I'm going to outline below on a daily basis. This blog post is meant to give you a glimpse into the mind of an inbound marketer and show you what a day in our shoes looks like. I always begin my day by reviewing my to-do list. After years of just jumping into the day without a plan, I've found that knowing what my Big Rocks are (the 1-2 main things I want to accomplish that day) really helps ensure a productive day. So I will start off by reviwing our Calendar, where we have organized our upcoming content, events, campaigns and major tasks. My day starts by navigating to our Calendar to see if I have any upcoming content that I need to block out time to create. If I do then I'll put it on my to-do list as a Big Rock. Now for me, I’ve learned that when I complete my Big Rocks first, I’m freed up emotionally and time-wise to work on the other inbound marketing activities that I enjoy so much. So that's where I'll dive into first. Once that’s done I can get into super fun inbound marketer mode! The next thing that I do in my day as an inbound marketer, is get a 10,000 ft view on how our major inbound campaigns are currently performing. I’m talking about website traffic, blog analytics, landing page statistics, etc. I want to see - from a very high level - whether we’re on the right track towards reaching our goals. Lucky for me, HubSpot gives me the top-level insight that I’m looking for, right from our homescreen! On HubSpot's dashboard is a group of "Marketing Performance" charts that shows visits, contacts and customers across a span of time. So I'll start here and look at how our marketing is currently performing against our goals. At this point I’m asking myself, "Are we ahead of pace, on pace, or behind?" I simply want to see - at a glance - how we're doing. I'm only going to dive deep into any area if I see any anomalies (like if Visits had a huge spike). Otherwise I'm getting my 10,000 ft view and then moving on. Next I'm going to take a look at the most recent blog articles that I've published, and see how they're performing. I'll do a bit more robust analysis here, and will compare the blog article performance against our monthly goals (which I have stored in a Google Drive Spreadsheet). In the HubSpot Blog tool I’m looking to see how many views our recent blog posts have gained and if there are any social media shares of that content. After I look at blog analytics, I typically check out the analytics for my landing pages. For a landing page I'm taking a look at the number of views it's gained (and from what source the views are coming), but I'm also really interested in the conversion rate of that page. I'm asking myself, "How is my call-to-action performing?" I have a goal conversion rate depending on the type of campaign that I'm running. So I'm looking to see whether the conversion rate of page visitors to form fills is hitting my goal. If not, then I'll brainstorm some potential ways to improve the conversion rate (perhaps by adding a different graphic, writing new copy on the landing page, or adding/subtracting form fields). Once I look at recent and relevant landing pages, I'll check out some of the static pages on our site that I know get a lot of traffic. For us (and probably you) that's our Home page and About Us page. Again, I'm looking to see whether the conversion rate of those pages is meeting our goal. If not, I'm going to experiment with changes to help us hit our goal (on our Home page it might be a banner on top that points to our next webinar or some other lead capture agent, on our About Us page it might be a call-to-action to download our culture code). My goal with analysis is to make sure everything is tracking towards meeting and exceeding our SMART goals. Now that I have a good sense of where we are, next I'm going to get into content creation mode. We have an editorial calendar that we follow each month which makes it easy to know what type of content is up next. Some weeks I'm creating new, original content. Some weeks I'm curating content. And some weeks I'm re-optimizing and publishing old content (here's a fantastic article from hubSpot about the power of re-optimizing older content on your blog). If I'm not working on a blog post to be published, then I might be working on a longer piece of content like an ebook. Our goal is to release ebooks at least on a quarterly basis, and our ebooks tend to be longer and more robust than our blog posts. So they take a bit longer to write. We also do a lot of repurposing at 98toGo, turning things like webinars into ebooks, blog posts, etc. So not all of my writing is original and I may not be doing a ton of writing at all. But I'm still creating content. Writing emails, creating landing pages, and writing social media posts also falls in the category of Content Creation. The point is, each day I'm typically blocking out some time for creating content. After I’ve analyzed, checked on my goals and have created content, next I’ll spend some time connecting with other marketers and influencers online. If I have an ebook or a campaign where I’m looking for the help of influencers, then I’ll be digging into my bag of tricks to engage with them and get on their radar. For example, we put together a roundup blog post a few months ago about inbound marketing failures and fixes. For this post I reached out to a handful of influential inbound marketing agencies and marketers through Twitter, and asked them for some inbound marketing insight. This particular blog post required multiple rounds of outreach and follow up, and it’s that sort of community engagement which takes place during this part of the day. This step is probably the less “processed” than all of the others, because building relationships is more art than science. Yes, you can shoot out X number of Tweets to people per day and leave Y number of comments on popular blogs, but that doesn’t ensure any substantial relationship will be formed. My goal here is to be as helpful and cordial as possible, looking to provide value wherever I can, and only extract (or ask for something) once the other person knows, trusts or likes me. It can take time, but it definitely reaps rewards. Analyzing what’s happening, creating new content and engaging with my community and network can easily take up an entire day. But there are a whole host of other tasks that I may do during a day that I did not outline above. What about giving presentations or holding inbound marketing workshops? What about attending conferences and meetups? And how about the prep that goes into things like that? Inbound marketers in 2015 are truly renaissance men and women. The amount of responsibilities and activities that fall underneath the umbrell of "Inbound Marketing" is truly amazing. Sometimes overwhelming. But no matter what you do each day, it’s always about balance. Your day as an inbound marketer will shift as things move within your organization. But as long as you’re hitting the above areas, frequently enough to keep everything afloat and moving in the direction that you have set as the trajectory for your organization, then you’re in a great place! Even More: Where To Go Next? I’m going to publish more blog posts like this (where I dive into the processes and workflows that we follow here at 98toGo), so sign up to automatically receive our blogs when we publish them so that you’re not left out. Just click the button below to join other marketers and business owners looking to get a leg up on their inbound marketing.